None of us ever set out to live a life with chronic pain and illness, but it happens. There comes that moment when you are sitting in yet another doctor’s office going over your symptoms for the third time that week, and the physician is simultaneously squinting his eyes, trying to make sense of your laundry list of complaints while scribbling something in your file — when you realize that your story might not ever have a Cinderella ending. You panic. You may throw things (when you get home). Niagara Falls begins to erupt from your eyes. And then gradually, over time and much heartache, you embrace Plan B. My Plan B was immersing myself into the wisdom of Toni Bernhard’s writing on the topic of chronic illness. In my opinion, there’s no one who understands the frustrations of being unfairly stymied in your life by an illness as well as Bernhard, but who offers a hopeful perspective without charging you with a bunch of actions that promises a “cure” like so many other self-help books do. Bernhard, a former law professor and dean of students at the University of California-Davis, caught a viral infection in May of 2001 on a trip to Paris and has been mostly housebound — often bedbound — since. I read her first book, How To Be Sick, at a critical time in my recovery a year-and-a-half ago when I decided to start living around my symptoms instead of fighting against them on an hourly basis. Her insights have led me to peace, and helped me to embrace my illness in a way that has substantially reduced my suffering. 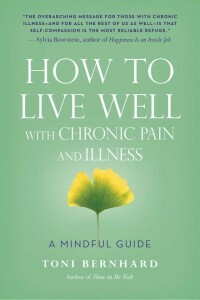 Now, she has just published a new book, How to Live Well With Chronic Pain and Illness. Like her first book, it’s packed full of helpful advice, including skills to help with every day, how to communicate with family and friends, managing toxic thoughts and emotions, and dealing with isolation and loneliness. 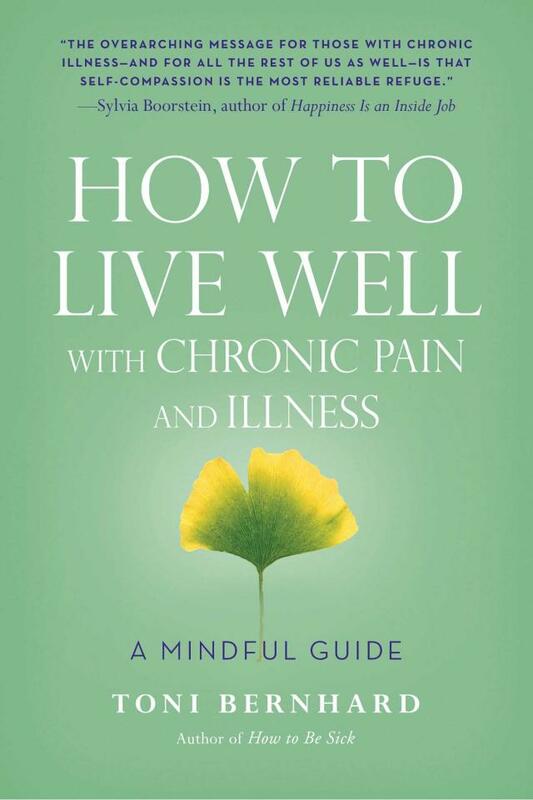 Here are just a few favorite insights of mine that she offers in her book to help you live better with chronic pain and illness. Do not put your pre-illness life on a pedestal. They are all ways of learning how to be kind to yourself, which Bernhard would say is the most important lesson of all. “Self-compassion always comes first,” she writes. “If you think that treating yourself with compassion is too self-absorbed, remind yourself of the Buddha’s words: ‘If you search the whole world over, you will find no one who is dearer than yourself.’” We so often associate the word “kindness” with our actions to others, but it’s equally important to treat ourselves with respect and compassion. This lesson has been one of the most difficult ones for me as a stage-four people-pleaser. Whenever I summoned up the courage to say “no” as a young girl, I endured silent treatments and other fun stuff. Going into my second decade with a chronic illness, however, I have no choice but to utter the two-letter word with regularity. That is, if I want to reduce my symptoms as much as possible. In responding to other people, Bernhard relies on Buddha’s teaching on skillful speech — we should speak only when what we have to say is true, kind, and helpful. So when someone asks her to do something, she asks herself, “Would saying ‘no’ as opposed to ‘yes’ be true to myself? Would saying ‘no’ as opposed to ‘yes’ be kind and helpful to myself?” Think about this the next time you are asked to do something: Will your response be true to yourself, reflect your values, and EASE your suffering, as opposed to intensifying it? Or are you responding out of social pressure and a pattern of people-pleasing? Bernhard says it gets easier to say “no” as you begin to do it more often. “Our desire to satisfy the Want Monster can feel so intense that we can talk ourselves into believing that getting what we want is necessary to our very ability to be happy,” writes Bernhard. For a long time, my deepest desire was to regain the good health that I enjoyed in my 20s. I could eat pizza and ice cream without suffering painful consequences. I enjoyed hosting parties with my husband. I didn’t have to keep a mood journal and assign each day a number between 0 (no death thoughts) and 5 (worrisome suicidal ideations), along with the day in my menstrual cycle, medications and supplements taken, and food and beverages consumed. This happiness comes from making peace with the stark realities of life — that it’s a mixture of pleasant and unpleasant experiences, easy times and hard times, getting what I want and not getting what I want. It’s that way for everyone, and has always been. This happiness comes from opening my heart and mind to engage each day fully, even though I know it may be a day in which the Want Monster goes hungry. It took several years of chronic illness for me to recognize that I was causing myself undue mental suffering by spinning stressful stories about my physical discomfort and then accepting them as true without question simply because I had thought them. Mindfulness practice was the principle too that helped me realize was I was doing.